They are weak. Disgusting. Cowards. Last week, I, along with several bloggers sat down in front of the computer to watch an advanced, online screening of the new movie, Mighty Fine. Through a platform known as Constellation, I was able to interact via chat during the movie with the other bloggers. It sure made the one hour and twenty minutes running time pass by in a flash. This interactive approach allowed bloggers from various states the opportunity to connect. We were able to share our thoughts and opinions on the plot as it unfolded before our eyes. And you know bloggers have A LOT to say! Mighty Fine stars Chazz Palminteri, Andie McDowell, Rainey Qualley and Jodelle Ferland as The Fine Family. The movie wasted no time diving into the deep end by offering a lot of drama upfront. Early on, I knew that I would develop a strong dislike for the father, played by Chazz, because of his roller coaster ride of emotions. One minute he was showering his family with the luxuries of life; the next minute he was threatening to take their life away. I enjoyed the movie– the setting, the characters, the plot and the message. With most movies being all about big budgets and overly-produced themes, it was refreshing to watch an independent film whose mission was to tell a story. The actors all displayed the necessary amount of emotion to make their characters come to life. Their performances were believable. I understand what it's like to be in an abusive relationship. I used to be in one. As a mother, my heart broke when Andie McDowell kept her girls in such a unhealthy environment around their father. I knew that she felt helpless, just as I did. Because the periods of low are quickly "fixed" by a period of high, you give that person another chance. It will get better, right?! You'll find yourself rooting for this family and praying that everything will work out. A powerful family drama about a father's love for his wife and daughters, and their vulnerability in the face of his unpredictable and explosive rage. "Mighty Fine", premiering in select cities May 25th, explores The Fine family dynamic and how the effects of an unstable parent can ripple through a family. The film strikes a chord among those who’ve experienced the often incomprehensible behavior of an abusive parent. It also makes the connection between economic uncertainty and its impact on people whose mental health is already precarious. After viewing the movie, we were treated to a Q&A with the cast members. Will there be a happy ending? 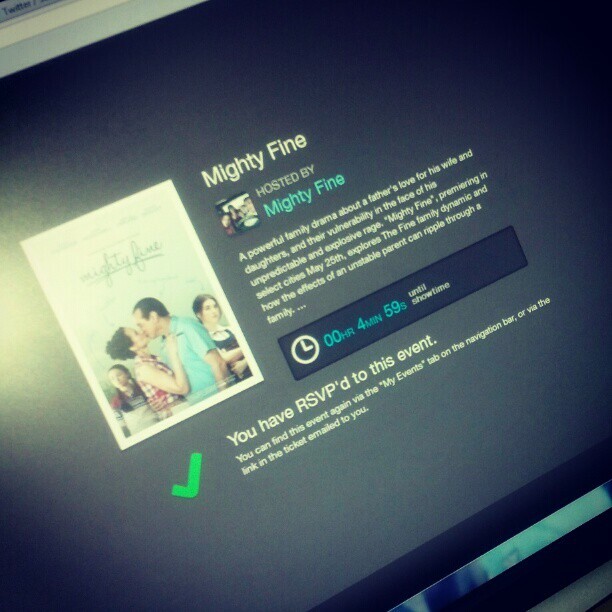 Find out when Mighty Fine hits select theaters on May 25, 2012. For a list of the areas and theaters participating, visit http://mightyfine-themovie.com/theaters.html.